Prior to this lecture I did my own research on his background and became familiar with his style. Part of 8vo, typographer and now a teacher he has had some fantastic experience for over 30 years.At college he never did art but science, from a young age he realised that making things interested him. But being an amateur photographer got him into uni at Bournemouth and Poole Art and Design School. After this he went onto do a Visual Communication BA, where the course leader was Benno Zehnder. It was at this time the work of Wolfgang Weinhart’s poster design of integrating text and image caught his eye. He later went on the Basel School of Design, where he was taught by Armin Hofmann, Kurt Hauert and Andre Gurtler. After this he didn’t know what to do so he spent 4 years working as a 3D designer. In 1985 he later formed ‘8vo’ with Mark Holt and Simon Johnston. This collective partnership was derived from the printing definition ‘Octavo’. The work they produced was very much influenced from outside of the UK, and they concentrated on typeface design working together. 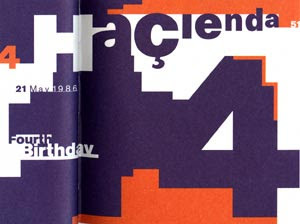 They worked on Hacienda posters, using collage and hand rendered type on full size posters. It was very much cut and paste. As it was pre-comp there was no record of what it looked like so they took photos to document it. Thank god they did, they were beautiful to look at and so different to the processes we go through now! It was a slow process though; a small correction could take hours. 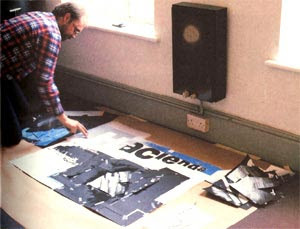 All the posters they designed were photographed in the environment. He believes that photography is disappearing; we are relying too much on 3D/digital, there is a massive difference between the two!The guitar album is only one example that shows how they used layers of glass, hand rendering the type, altering the light to get a photograph that would become the final image. 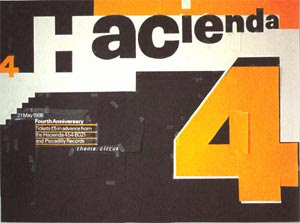 I really liked the Hacienda’s 7th Birthday poster which illuminated at night, adding a quirky edge, always improving their ideas. The first computer they got cost £8,000. It took them a year tO use it and even then it was he computer controlling them not the other way round. Finally, they turned it around and began to create posters with a visual impact, distressing type. The 8vo magazine released in 1986 was designed to be a 16 page booklet that would only have 8 issues, 1 every six months after this it would self destruct. It was a journey through type, each issue had its own individuality, whether with a grid or not it interacted with the viewer. In 1990, they had a two year break and the last issue was an interactive CD rom with voice interaction. The irony of it now is that it cannot be played, technology has out run it. That is the beauty of it, it now exists in a physical time and place. After this he worked for the Boymans van Beuningen Museum for 5 years designing the posters and brochures.The Flux work he did really interested me, as he spoke about creating a system that was an important feature for any design. It was a design identity that could be applied into other advertising/media. The system has a purpose and function. The work for 8vo closed in 2001 as web design had caught p with them, so now he teaches at the LCC and is a visiting lecturer at the Basel School of Art. 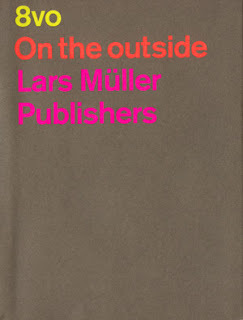 Some advice: There are too many books on Graphic Design but least his book on ‘8vo’ had something worth saying. It mentions pre comp and how the Industry has changed, talking in an honest way.The role of Graphic Design now is different to how it was. We now have to do it ourselves, there is no dialogue. 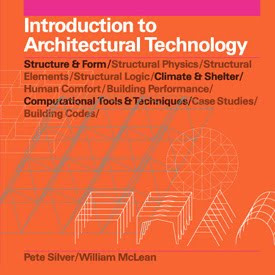 His work is a great insight to how it was, obviously now we have it too easy...there is a missing link of creating it ourselves, being involved with the elements in a natural way. For him though, how amazing to have seen this change happen, the progression from what it was, to what it is now, and then to where it is going. What an experience...The type design he is working on now ‘three six’, is all about playing with human perception, overlapping and interlocking become very abstract but the human eye and brain can still determine what the word is. This is very interesting and relevant to my Silence project.